Twitter confuses me. But so did LinkedIn when I joined it seven years ago, but I was patient with LinkedIn and will continue to be patient with Twitter now. I am not an ‘early adopter’ of technology preferring others to lead and my experience with Twitter is no different. Let me humbly share with you my thoughts on Twitter for career practitioners after two years. My profile says I joined in February 2011 but I think I was shell-shocked the first two years. How do you fit an idea in 140 characters? KEY POINT #1 Be thoughtful and patient. It really is amazing how much you can share in a tweet if you think about the essence of your message. How can people communicate only using 140 characters? Verbosity is clearly not rewarded here in “tweet world”. I think Twitter was created by an introvert and early on attracted more introverts who found a way to cut down on the noise created by us extroverts. Twitter requires some thought on messaging and has really forced me to be a minimalist. 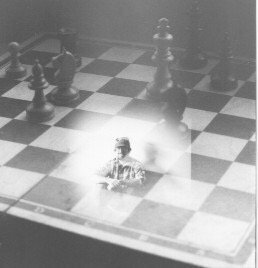 As I wrote in a recent blog, “Less is Best” http://bit.ly/peakcareers7 and Twitter challenges this thinking all the time. KEY POINT #2 Twitter is a community of people that has a culture like every other community. You will find career practitioners who are serious about helping others and adding value to our community but Twitter has a playful side to it that LinkedIn does not. By using hash tags # in front of a word you will find discussions around that topic. I use #career when tweeting information and this will place my tweet, not only to people following me, but also in the “community” of others using that hash tag. There are MANY communities out there on twitter, just get out there and explore! “Holy jumping up and down Martha!” If you weren’t confused before, you MUST check out a TweetChat! TweetChats use the hash tags to post questions and then respond to them. 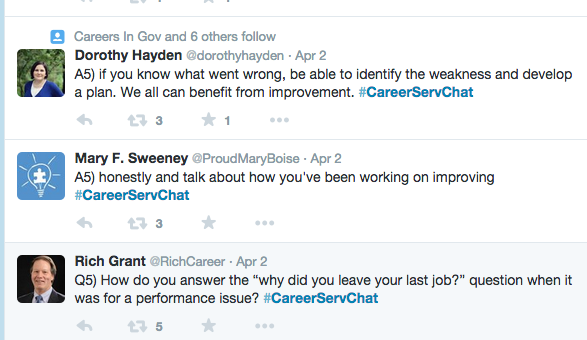 Here is a screen shot of the #CareerServChat tweet chat. And then people begin tweeting responses to it using the #CareerServChat hashtag so the entire discussion can be followed. Yeh, crazy but I’ve learned a lot from others and have enjoyed the communities I’ve participated in. KEY POINT #3 Follow people who are aggregating the information you want. You don’t have to follow lots of people and read 100’s of blogs on Twitter each day, you just need to find the people who are sharing the information you want. They will often use links to articles and tools using website shortening tools such as bitly.com to share ideas and create discussions. (albeit short discussions 🙂 If you are new to Twitter find people who are leaders in the career field and see if they have a Twitter account and how active it is. There are LOTS of great people doing some great things out there. Check out my friend Rich Grant @RichCareer and then see who he follows. KEY POINT #4 Start slow if you want, but be active. What I mean by “active” is simply find a couple people each time you go on Twitter and follow them. Unlike LinkedIn you do not need a reason to “follow” them. Just do it. Want to follow Johnny Depp? Go do it. Find someone posting good information in a TweetChat, “follow” them. And then be “active”. Retweet one of their posts or click on the little star under their tweet to show you like it. Simple, no cost, no sweat, but shows you are listening and we all like that. KEY POINT #5 Twitter can be used as a research tool in the career development process. Most companies have a Twitter feed and they are sharing jobs, opportunities, and information. If you are interested in a company you need to check out their website, LinkedIn pages, and their Twitter feeds. In particular, if you are applying for work at a company, you should be “following” them. I know people who learned about jobs on Twitter and were hired partially because of their professional presence on Twitter. IN SUMMARY, don’t be afraid to wade out into the waters of Twitter. It does not have to take a lot of time (although some people tweet so much I am not sure what they do for a living). You are welcome to ‘follow’ me but don’t expect too much, I am not active daily, probably weekly is a better time frame for me. Note: If you would like to explore this topic further, check out the 4-week online seminar, “Twitter for Career Practitioners” taught by Rich Grant.